As a young girl, I found a copy of William Blatty's The Exorcist and read it in less than two days. It was the most engrossing and horrific book I had ever read. I still have never found its equal. The book itself was beautifuly written and terrifying, but what made it even more scary was what was written on the inside flap of the book. There it said that the book was based on a true story. Of course, "based on a true story" is never the same thing as a true story. The true story behind The Exorcist is also terrifying, but very different from the book and the movie. 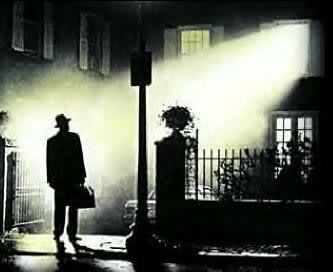 The Exorcist was based on the story of a 13 year-old boy named Robbie. In January of 1949, Robbie lived in Maryland with his family and was very fond of his aunt. His aunt and he began to play the ouija board together. They enjoyed the game and were able to contact a friendly spirit. Robbie's aunt wasn't always available to play with him, so he began playing by himself when she wasn't available. Suddenly, the family began to notice various odd noises around the house. They heard dripping and scratching and things that sounded like mice in the attic. These noises began to escalate with time and ended when Robbie's aunt died. After Robbie's aunt died, things got worse. Robbie's bed began to shake violently at night while he was on it. Objects flew around his room for no reason. Things broke. A vase was hurled at Robbie's mother. Robbie began ot use the ouija board more regularly in a desperated attempt to contact his aunt for help. Robbie's parents took him to see doctors, psychiatrists, psychologists, psychics, and ministers. The first three were unable to help. In 1949, anti psychotics and regular medical treatments for severe mental illness had not yet been discovered. So it would have been fairly normal for mental illness to be untreatable during this time period so this in and of itself isn't evidence of a possession. However, the minister and the psychic both recommended an exorcism by a catholic priest. Robbie got worse and entered a trance state. Scratches appeared all over his body. Finally, after months of coping with the ordeal, Father Hugh's was contacted and the exorcism began. Of course, it wasn't as easy as it was in the movies. The boy was at a hospital, tied to the bed. The process took weeks. At some point, Robbie got a spring loose from the bed and cut the priest. The process was a nightmare that offered no help to young Robbie. The boy spoke Latin and told the priest he was the devil, but for some reason the mother thought that he was possessed by his aunt. You can learn more about Robbie's long and horrible ordeal in the book "Possessed, The True Story Of An Exorcism." It was written by Thomas B. Allen. The story is obviously more complex than this little synopsis and the book is worth reading to get the entire story. Very interesting - sounds like a horrible situation for Robbie and his family. I'll look into finding that book. Regardless of the ultimate cause behind it, the fact remains that the possession phenomenon is very real, and it warrants much more investigation. Great post! Thanks. I agree, the possession phenomenon is very real and terrifying because in many cases there seems to be no way to fix the problem. I would love to read this one. Their is so much information on this. I follow stuff like this cause it is true. Can't wait.